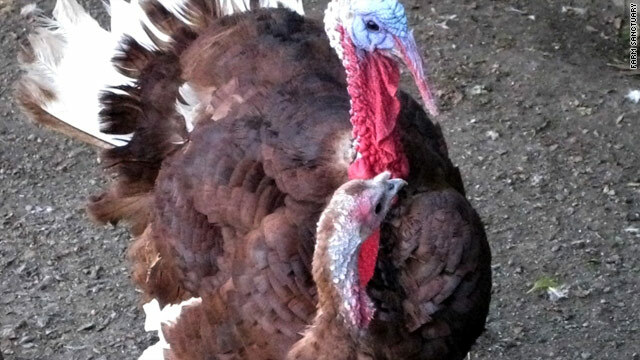 Mordecai and Fiona, two heritage turkeys, would have been slaughtered if Joan Poster hadn't adopted them. (CNN) -- Only two weeks into the adoption, Mordecai and Fiona are already exhibiting distinct personalities. Mordecai, the male heritage turkey, is outgoing and playful, bobbing his head happily as his neck changes color from bright red to blue, depending on his mood. Fiona, the mellower of the two, prefers to sit next to her new parents. They will not be on the table this Thanksgiving. "They are wonderful," says Joan Poster, 66, of Westport, Connecticut, who adopted the turkeys last month from Farm Sanctuary's Adopt-A-Turkey Project. "They are just really sweet turkeys." Come Thanksgiving, turkey is often a quintessential part of the celebration for many American families. The National Turkey Federation estimates that Americans consumed more than 46 million turkeys last Thanksgiving. Nearly 88 percent of Americans surveyed by the organization say they eat turkey during Thanksgiving. But a few animal lovers and meatless eaters are saving a turkey this Thanksgiving rather than feasting on one. Gobbling and hobbling at about 15 pounds each, Mordecai and Fiona are organic heritage breed turkeys, cherished for their rich flavor and colorful plumage. Heritage turkeys have become more popular to eat in recent years, Poster said. The birds would probably have been Thanksgiving dinner if not for Poster, a veterinarian who does not eat meat, and her husband, Dennis, who figured their spacious farm could be a refuge for the desperate birds. Poster is one of dozens of volunteers this year who have agreed to welcome a turkey into their home. Since 1986, Farm Sanctuary, a nonprofit that works on saving farm animals from slaughter, has placed more than 600 turkeys into homes through the Adopt-A-Turkey Project. Animal activists say they do this because the turkeys are often treated inhumanely, living in cramped and unsanitary holdings. Most of the spared birds are commercial turkeys, bred for the dinner table. Commercial turkeys tend to be larger than wild or heritage turkeys; many of them are overweight because of hormone injections that take them up to about 30 pounds. As pets, commercial turkeys can be more of a challenge since they often suffer from arthritis in their old age. Like in any proper adoption, volunteers must pass a screening process. Although it's not a requirement, a majority of them are vegetarians or vegans. The individuals must have an adequate facility to care for the bird, such as a barn or a sizable yard. The organization prefers adoptive "parents" who don't have other domestic animals or children who might chase turkeys. The nonprofit will deliver the turkey to the adoptive homes. Adopting a turkey, some volunteers say, is no different from having a dog or a cat. "Thanksgiving is a difficult holiday for vegetarians and for people who care about animals on farms," explains Gene Baur, co-founder and president of Farm Sanctuary. "There is this celebration that revolves around these tortured bird bodies. We wanted to come up with a Thanksgiving tradition that honors animals and that is humane and compassionate." Baur, a vegan, says there are plenty of alternative dishes to turkey. His Thanksgiving meal will be complete with butternut squash, beet casserole, mashed sweet potatoes and a spread of whole-grain breads. He says the public is becoming more receptive to his turkey adoption project as a burgeoning food revolution -- thanks to films such as "Food, Inc." and "Super Size Me" and books such as "The Omnivore's Dilemma" -- continues to change the way Americans think about food. He points out that alternatives such as Tofurky, a vegetarian "turkey" made of soy, are being substituted for turkey. The food awareness is a contrast from when Baur started the Adopt-A-Turkey Project in the 1980s. Back then, people were shocked at the idea of liberating a turkey from the farm. "People thought we were crazy to rescue these animals," he said. " 'Why are you saving them?' You know, that kind of attitude." Although not every family can welcome a turkey into their home, people can donate money to sponsor a turkey to live at one of Farm Sanctuary's spacious farms in New York and California. The turkeys are placed in a new home along with other pigs, goats and cows the organization has saved from slaughter. The official tradition of pardoning turkeys has been going on at the White House since 1989. This week, President Obama pardoned two 45-pound turkeys named Apple and Cider. They will live the rest of their lives in Mount Vernon. Others have taken up the turkey saving cause on their own. Karen Dawn, an animal rights activist and author in California, rescues two turkeys each Thanksgiving. She drives to the local slaughterhouse, where she purchases the birds for $1.59 a pound. She named the two female commercial turkeys Portia and Ellen after celebrity vegans Portia de Rossi and Ellen DeGeneres. After a few months, she usually donates them to a larger farm that houses rescued animals. When the fluffy white birds arrived at her home, she washed them in her bathtub and blow-dried their feathers. She lets them live in her backyard, where the children in the neighborhood can visit them. "They would have been dead in a day or so if they hadn't come home with me," Dawn said.